"She's a bit odd, but a real pearl." Although the French New Wave of the late 1950s and 60s revolutionized cinema, it was less a homogeneous and well-defined movement and more a collection of individual filmmakers who each broke with cinematic tradition in their own way. Truffaut explored genre filmmaking, Rohmer substituted a pattern of dialogue and introspection for causality, Godard exploded the basic language of film, and Claude Chabrol, with his examinations of the contradictions inherent in the French bourgeoisie, provided a consistent and sustained critique of melodrama and its narrative functions. Although Chabrol's early films jump-started the New Wave, he's often seen in a lesser light than his fellow filmmakers. Prolific to a fault, Chabrol was seemingly willing to accept any commercial project that fell his way, especially in the 60s when his cohorts were doing some of their most fascinating and revolutionary work. It's only in the following decade that he would find his footing, but once found, he never looked back, and he's spent the remainder of his career exploring variations on a theme, the thin veneer of respectability of the bourgeoisie and how the cracks in this veneer eventually reveal that it is nothing but a house of cards. Most of Chabrol's films are scathing in their portrayal of the hypocrisies of the social class to which he himself belonged, but in the 90s he mellowed and his films became more balanced, less an indictment than almost-wistful examination of the bourgeoisie, and it's in this context that La C�r�monie is found. Paterfamilias Georges (Jean-Pierre Cassel) and his wife Catherine (Jacqueline Bisset) live a happy existence in their large country home with their daughter Melinda (Virginie Ledoyen) and son Gilles (Valentin Merlet). Into their lives comes the new maid Sophie (Sandra Bonnaire), and it's immediately apparent that something's not quite right with her. By turns taciturn and almost non-verbal, she isolates herself in her room as soon as she can. But she's a hard worker and good cook, and the family's willing to overlook her few quirks, including a fear of machinery. They're completely unaware that Sophie is illiterate, which she disguises in a number of clever ways. Sophie is soon befriended by Jeanne (Isabelle Huppert), who works in the local post office, and the first cracks in the fa�ade of normalcy appear, as we learn that Georges believes that Jeanne's opening the family's mail. It's not long before we learn that each of these characters has a shady element in their past, from the suicide of Georges' ex-wife, to the possibility that Sophie killed her father, and Jeanne her own little daughter. The shared conspiracy between Jeanne and Sophie and their repeated giggling assertions that "they can't prove anything" binds them together, and the distance between them and the family grows ever-greater, until Jeanne and Sophie take ultimate revenge for a host of imagined wrongs. La C�r�monie is one of Chabrol's best films, and it's fascinating to watch how he treats his characters, substantially modified from Ruth Rendell's novel. The Leli�vres are a near-parody of an upper-class family, in their blissful happiness and shared activities, including the unlikely group viewing (including a young son) of a performance of Don Giovanni on television. Sophie's in many ways a cipher, seemingly willing to accept what life has given her, and it's only when Jeanne's class-conscious hatred of the family ignites a spark in her that she takes desperate action. Chabrol's known for his camera work and playful manipulation of subjectivity and objectivity, and those elements are in full play here. When Catherine is giving Sophie an introductory tour of the house, Chabrol shows us an apparently objective shot of an empty room, only to pull back and reveal that it's in fact seen from the viewpoint of one or both of the characters. With his repeated and insistent shots of the interior of the house and its decor, Chabrol both defines the family by their surroundings, and turns the house into another character, as fully defined and important to the story as any of the people who inhabit it. It's entirely appropriate, given that the essential characteristic of bourgeois life is that of owning property. Chabrol doesn't give much direction to his actors, preferring that they work out their personages for themselves, and the technique certainly pays off here. 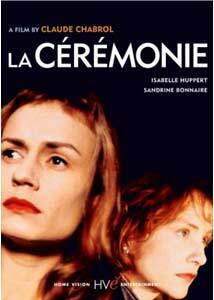 All the performances are good, especially Sandrine Bonnaire, who underplays wonderfully, and Isabelle Huppert as the voluble Jeanne. In a career as long and prolific as Chabrol's, there are bound to be some clinkers, but La C�r�monie is certainly not one of them�it's an excellent introduction to Chabrol for those unfamiliar with his films and a treat for those who are already fans of his work. Image Transfer Review: The first scene of the film is disappointing, with a soft image, washed-out colors and excessive edge enhancement. Things settle down quickly though, as the colors, detail and black levels all improve. Other than the pervasive edge enhancement, this is a reasonably good transfer. Extras Review: The nonanamorphic trailer is very soft, with inaccurate colors and nothing even remotely resembling black levels. The 18m:24s La C�r�monie - Le Making Of (as it's entitled on-screen) was filmed during the making of the movie, and combines on-set footage with interview sequences. Huppert and Bonnaire comment on working with Chabrol and analyze their characters, and Chabrol proves to be modest and almost self-deprecating when he talks about the film. The sound is a bit muffled in some of the interviews, but the full-frame video image looks great. Jonathan Rosenbaum provides a little more than three pages of notes, in which he compares Chabrol to Hitchcock and Lang, discusses how Chabrol's portrayal of the bourgeoisie had changed, and mentions some influences on and antecedents to the film. His comments are concise but insightful. A printed Chabrol filmography is also included. La C�r�monie is one of Claude Chabrol's best films, with a fascinating plot and interesting direction. The transfer is reasonable, and this DVD is a must for Chabrol fans.